Katherine Dell is a young adult fiction author fascinated by the supernatural and the stories that surround them. She began her writing endeavours in 2011 when she wanted to reinvent herself from her previous career as an event planner. When she’s not writing, she can be found in cold hockey arenas sipping coffee, working on her tan at little league games, or trying to keep her dog out of her many gardens. She lives with her husband, two boys, and fur babies, in Calgary, Alberta, Canada. When you are reading a book and it reminds you of your favorite movie or TV series, or if it takes you to your happy place, you know that you have selected the right one. Harmless by Katherine Dell reminded me of one of my favorite movies (Twilight) and one of my favorite TV series (Bewitched). Rachel Barnes, the leading character, is haunted by the death of her brother, Eric. He died about four years ago in a car accident and she is unable to move on with her life. To cope with the trauma, her mother relocates to a new place, Hazelton, with Rachel. She had trouble befriending people, but here she finally made four new friends (not best friends, but these are the people with whom she hangs out): Mason, Ryan, Chloe, and Julie. One day, when they were all at Rachel's house, they found a box, which her grandmother called a Spirit Box. This box contained carvings of a bear, a deer, a crow, and a wendigo. Although she warned everybody about the possible consequences of wishing over these carvings (aka spirit animals), nobody listened to her, and they all wished anyway. However, as expected, things started going south from that moment on. Harmless by Katherine Dell is a magnificently written book. The subtle merging of several genres, while keeping the central genre as paranormal, is a tactic expertly applied by the author to hold the attention of readers. The words in which Rachel expressed her attraction towards Mason are so beautifully chosen that they reminded me of Bella Swan's fascination with Edward in Twilight. The magnetic pull that she felt towards Mason was conveyed very delicately yet powerfully. I applaud the author for using just the right amount of words to make their attraction for each other elegant and not cheesy. Other than romance, another emotion that the author incorporated into the plot is the grief of losing a sibling. I could just feel Rachel's pain due to the loss of her brother, Eric. She was grieving the loss and was unable to move on. To deal with the pain, she delayed unpacking her boxes, as if it would help her turn back the clock. Her agony was expressed with an appreciable sensitivity. Since the central genre is paranormal, it had to be a major aspect of the plot and it really was. There are enough strange occurrences to keep readers both engaged and intrigued. I could not put down the book before knowing what turn their lives would take once the spirit animals came into action. It was interesting to wonder whether they would survive the consequences or would succumb to the tragedy that followed from the moment they decided to overlook the warning. The conversations are extremely engaging and realistic. The lives of the four friends are written as realistically as possible. They talk, behave, and act like the majority of teenagers. The author has done an incredible job in writing a fictional story based on the paranormal genre and yet it seems as life-like as non-fiction. Harmless by Katherine Dell is a paranormal tale of nature spirits and love. Rachel Barnes’ family has been torn apart by tragedy and all she wants to do is put the past behind her and move on. She moved to the senior high school in Hazelton, a somewhat more isolated place than she is used to, but she soon makes friends. When they find the spirit box that Rachel’s grandmother left, they decide to try to wish away everything bad but, as the old saying goes, be very careful what you wish for. The great animal spirits will help, but there is always a price to pay and they are about to find out just what it is. Instead of settling into her new home, Rachel is now in a race against time to stop a malevolent spirit from taking over and, in the process, she learns more about her past and is offered a future she may not be able to resist. Harmless by Katherine Dell is a gripping young adult adventure, a unique take on a tale that has been told many times. This is a story that takes you gently by the hand at the start, leads you calmly into the story, then grips you tight and takes you on a hell raising ride. There is absolutely no predictability about this story, no way of guessing where each twist or turn is going to take you, and that is one of the things that kept me reading. Add to that the diversity of the characters, the excellent development of both characters and story, and this is one book you will not want to end. It has suspense, adventure, romance, paranormal myth - everything needed to make a good book truly great. I would highly recommend this to anyone who loves a good paranormal tale, not just its intended audience of young adults, and I can’t wait for book 2. I am not a typical fan of the paranormal genre and I am very selective in what I read in this genre, but Harmless by Katherine Dell caught me off guard, thanks to the great storytelling skills, superb character development, and the splendid meld of coming of age themes with paranormal phenomena. Rachel Barnes has had her fair share of pain and tragedy, culminating in the divorce of her parents. She moves to the small town of Hazelton, BC, with her mother. They now live with her grandmother and Rachel seems to have a renewed start with new friends. Hanging out and partying with her teenage friends at her grandmother’s place is one of the things that seem to give back a sense of meaning to Rachel, but things change when they discover a spirit box. They make wishes on the box, hence releasing a wendigo. But things can never be the same again as the wendigo doesn’t only grant wishes, but expects something in return. Can Rachel stop the malicious spirit and save her friends or will she suffer another devastating loss? It’s for the reader to find out. This is a mesmerizing story that captures what life looks like in a small town. It is a story with powerful characters and a plot that reads like a pounding heartbeat. The reader quickly learns to love the protagonist, to follow her in her loneliness and the excitement of meeting new friends, but it seems like happiness is just something very occasional in her life. It is fleeting and nothing really seems real. The emotions are strong and the author injects a lot of humanism into the characters. They are not perfect, but they will instantly inspire feelings of sympathy in the reader. Katherine Dell’s Harmless is a page-turner, a story with a gripping plot, deftly written and focused. After her brother dies and her parents get divorced, Rachel Barnes is left an emotional wreck in Harmless by Katherine Dell. Moving from place to place to try to outrun the sadness takes Rachel and her mother from Vancouver to an isolated town in BC to live with Rachel’s grandmother, a full-blooded indigenous woman. Rachel’s bedroom is filled with unpacked boxes except for a Spirit Box, which her friends think is some type of game and they make wishes on the unique pieces inside. Rachel is happy to finally be fitting in with the other students and even has a boyfriend. She still questions what she really wants out of life, but at least she is feeling a sense of moving in a positive direction. Native lore is not to be ignored, however, and as the wishes the group made on the figures in the Spirit Box begin to come true, it is obvious that a price must be paid. Rachel feels responsible and wants to undo what has happened, but there is more to the legend than she is prepared to deal with. Who will have to pay the ultimate price for things to go back to normal, whatever that may be? Author Katherine Dell has expertly captured the emotional turmoil of a teenager who has suffered tremendous loss in Harmless. The bonus is the intense paranormal activity that underlies the entire story and weaves the lives of Rachel and her friends together. Great job! A wonderful balance between reality and the paranormal with an ending that tips the scales! Well written, highly authentic and full of mystery, Harmless is the first of a series that promises more terrific action and paranormal intrigue. Rachel Barnes’ life seemed to change forever after her older brother, Eric, was killed in a car crash when she was just fourteen. Her parents divorced and she and her mum set about moving house, time after time, trying to find a place to settle down again. 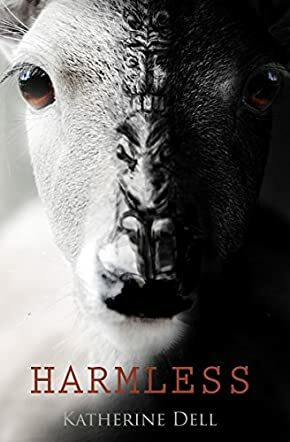 In Harmless by Katherine Dell, they’ve now left Vancouver and settled in her mother’s small home town, with Rachel’s grandmother – a full-blooded native of the area. Despite being there for five months already, Rachel has yet to even unpack her boxes of stuff that she brought with them. When Rachel and her friends open a spirit box given to her by her grandmother, strange things begin to occur. The spirits released, the white deer, crow and bear offer wishes to the young people, but also released is the evil “soul reaper”, the mythical black wendigo. Rachel just wants to find her place in the world – can the spirits help her in that? Aimed fairly and squarely at the young adult market, Harmless finds its mark. The characters of Rachel and her friends are clearly archetypal high-school seniors, unsure of where their lives will head after school and nervous about the prospects of leaving their home town and their friends to venture out into the world. Dell has done a good job of building the characters. Rachel especially was easy to identify and empathise with. Her angst over her brother’s loss is the centre of this story and Rachel’s friends merely bit players who aid her in her quest for freedom from the pain of her loss. I particularly enjoyed the supernatural portion of the story and the exploration of the native myths and legends that created the spirit box and its contents. From a target audience perspective, this is a very readable book, with the usual teenage angst and love interests. I did enjoy the tenseness and conflict of Rachel’s relationships with the two male characters in her life; Mason and Nate. I think Katherine Dell has related an interesting and easily read tale here in Harmless and, as the first book in a planned series, it’s a good start.